The Rosetta mission of the European Space Agency was launched in March 2004 after almost twenty years of planning. Originally the spacecraft was intended to study the comet 46P/Wirtanen, but delays to the launch date caused by the failure of an Ariane 5 rocket meant that a new target had to be selected – comet 67P Churyimov-Gerasimenko. After a long and risky journey that took more than 10 years, the spacecraft drew close to the comet and in November 2014 was able to deploy the lander Philae which reached the comet’s surface (the first ever controlled landing on a comet). Unfortunately, the lander ended up in an unfortunate position in deep shadow which meant that it couldn’t recharge its batteries after landing, and so the amount o date returned from the instruments on Philae was less than had been hoped. However, the Rosetta spacecraft itself carried a large suite of instruments, and it was able to track the comet from January 2014 until September 2016 (an extension to the original mission that would have ended in December 2015, in order to allow Rosetta to stay with the comet as it moves away from the sun and to move closer to the comet – at a higher risk). VIRTIS an infrared imaging system used by MiaRD to infer surface temperatures. backed up by laboratory work involving analogue materials and processes. The figure below shows which of the MiARD partners are associated with the instruments from which the project will require data. 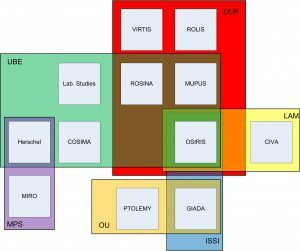 UBE = University of Bern, DLR = German Air and Space Research Centre, LAM = Laboratoire d’Astrophysique Marseille, MPS = Max Planck Society, OU = Open University and ISSI = International Space Science Institute – see also The consortium. The different phases of the Rosetta mission, and which instruments operated, are described in detail in this plain text document from ESA’s Planetary Science Archive.